1966 is the undoubted creative peak of the Fantastic Four. With the addition of Joe Sinnott's first-rate, slick inking, the book never looked better, and is taken to new heights of cosmic storytelling and cold war angst. The themes displayed within this superb collection of stories were vital and full of the fears and concerns of a deeply troubled time. In America, the Civil Rights Act of 1964 was changing the landscape, but tensions didn't evaporate overnight. Civil Rights movements continued throughout the country, and in August 1965 the Watts Riots broke out, with six days of unrest in Los Angeles resulting in 34 deaths. It was in this politically charged environment that Stan and Jack introduced the first mainstream black superhero, T'Challa, the Black Panther. The character was dreamt up under the less politically aware name of "The Coal Tiger", and if it seems that the final title was explicitly socio-political, then checking the dates shows that Stan and Jack's name for the character was either fortuitous or unfortunate, depending on point of view. The Black Panthers were formed in October 1966, three months after the cover date - to say nothing of the actual publish and inception dates - of issue #52. Roy Thomas would go on to address such an issue in 1972 when he would temporarily change T'Challa's codename to "The Black Leopard". It makes for an interesting dynamic within the book, because while T'Challa and his alter ego are independent and noble, his representation is still transcribed by someone with history of the imperialistic viewpoint. Thus, despite the honourable intentions, The Black Panther is still being depicted through the eyes of historical archetyping and cannot truly possess the Imperial Gaze. With Johnny's new Native American friend (though still referred to as an Indian until the 90s, or "Geronimo" by Ben) Wyatt Wingfoot listening out for clues on the ground and T'Challa's tribesmen performing dances and playing jungle drums, it's a hotbed of clichés thankfully punctured by the Thing's acknowledgement of such. Particularly intriguing is the revelation that Kirby originally drew the character with a half-mask, which was later changed to a full mask so that the cover wouldn't depict his skin colour. However, Kirby was still drawing the character wtih a half mask throughout his time on the book, and it was down to inker Joe Sinnott to fill in the full mask over the top. When the character was introduced into The Avengers in 1968, John Buscema was also drawing him with the half mask and getting it past the inkers... though when Jack Kirby returned to Marvel in 1977 to draw the Black Panther's own series, he then drew him with the full mask. The reasons behind the change have never been fully explained, though the suspicion is that even in the mid 60s, having a black superhero on the cover of a comic may have too controversial, as archiac as such an idea may seem today. Although Marvel prides itself on such characters, which are earnest (albeit naive) attempts to promote racial integration, it wasn't always the case. When the company was still named Timely, Stan spent the early 40s writing "Young Allies", a series of war stories that involved "Whitewash Jones" in adventures with titles like "The Terror Of The Jap Head". It's unknown if Stan himself wrote the advertising package that claimed the character could "make a harmonica talk, and watermelons disappear", but, despite a 70th anniversary special in 2009, this is one character who seems to have been, ironically, whitewashed out of Marvel history. 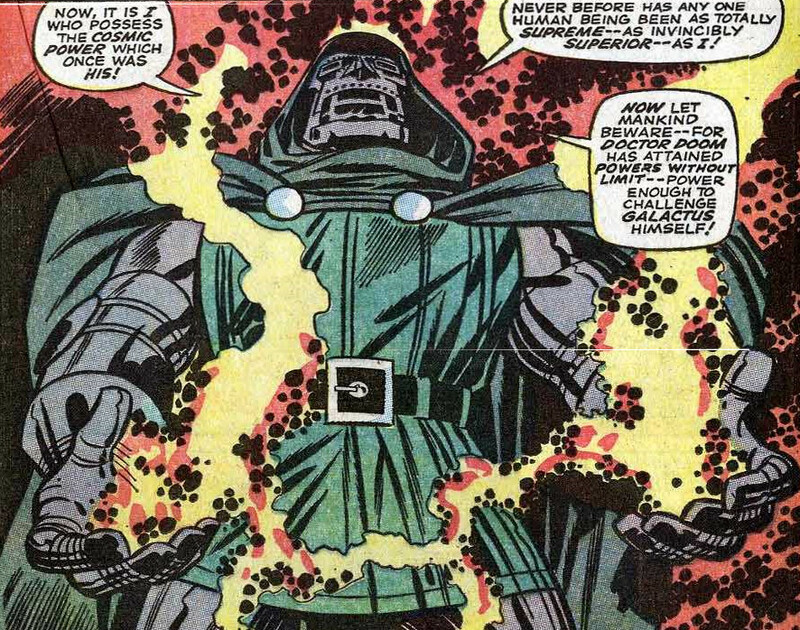 Perhaps the greatest achievement of the year is the creation of Galactus, devourer of worlds. Stan's love of hyperbole and unnaturalistic dialogue to capture the menace of the creature can seem quaint when read today ("It's like some mad, inconceivable nightmare… but, one from which we can never awake!") but elsewhere he shines. The previous year the US had begun sustained aerial bombardment on Vietnam, and had also employed ground troops for the first time, with the threat of mutual nuclear destruction still in the air. 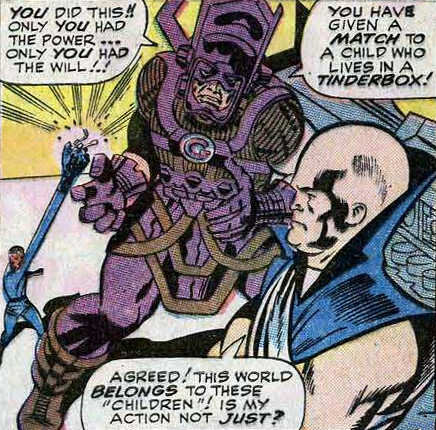 The idea of the Watcher giving one of the FF an all-powerful weapon was already something tried out (to far lesser effect) in the scrappy third annual, but here sees the Watcher and Galactus debate the moral implications of destroying all matter, with the outstanding dialogue of "You have given a match to a child who lives in a tinderbox!" "Agreed! This world belongs to these "children"! Is my action not just?" Kirby's run of covers would never be bettered, thought the final part of the Galactus trilogy boasting "At last! The Human Torch in college! Don't miss Johnny's first day!" does rather give the game away that all will turn out well. (Johnny enrolling in college does also stress that he's now at least 18, but possibly 19, given that he's referenced forgetting to enrol beforehand). With the book developing into overlapping narratives that lead into following issues, the stories sometimes wrap up before the final page is done. While classic, Galactus actually leaves Earth halfway through the issue, leaving the comic to take up more mundane yet engaging subplots. Although Galactus seemed a perfect one-off villain, his story ending with him vowing to never attack Earth again, he went on to make 17 return appearances in just the first volume alone, to say nothing of his regular appearances in later volumes and other titles, most notably The Mighty Thor. Some were vital, many were classic, and others just retread his first appearance to lesser returns. Such matters are symptomatic of Marvel as a whole, whereby the classic characters created in this year (which also include what were then secondary characters such as Klaw and, more significantly, The Silver Surfer) were continually reused by future creative teams with little new to replace them. The real curios on display here are the standalone issues. Although they still contain subplot elements that pass through them, Issues #51 and #54-#56 are the only issues of the year that contain a beginning, middle and end within the same covers. Long-term readers of the site may recall that I originally gave #51 an average rating when this site was launched back in 2004, slating it as mawkish and saccharine. While it's true that it does opt for earnest emotions that are not commonplace outside of American fiction, it's a genuinely touching, classic tale, and I have to put my hands up and confess, over a decade ago, to being completely wrong in this regard. The issue contains some odd plot elements like Reed unconcerned as to how a man looking like Ben can walk into the Baxter Building and get past the defences, and how the scientist who becomes the Thing knows about Aunt Petunia. But such nit-picking shouldn't get in the way of a good story, and "This Man… This Monster!" is a true classic, and even sees the debut of one of Ben's most endearing catchphrases, that of talking about a "crying towel". 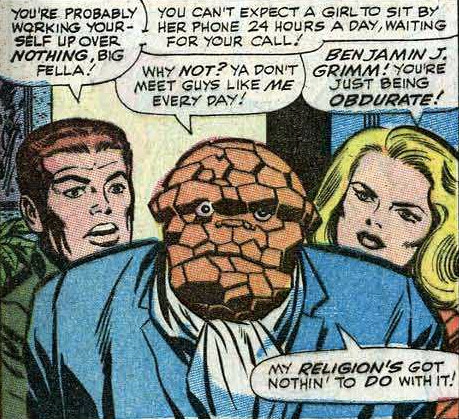 Reputedly slang dating back to the 1920s, it became a forgotten fixation of Ben's when other writers took over, but was always a charming addition to the 1960s and early 70s issues. The real oddity of the run is Whosoever Finds the Evil Eye!, a tale with Johnny and Wyatt meeting the real historical figure of 13th century king Prester John. Although the character seems a left-field one-off as far as the Fantastic Four are concerned, he was brought back within the pages of other titles, with 50 issues featuring him facing such enemies as the Defenders and Deadpool. 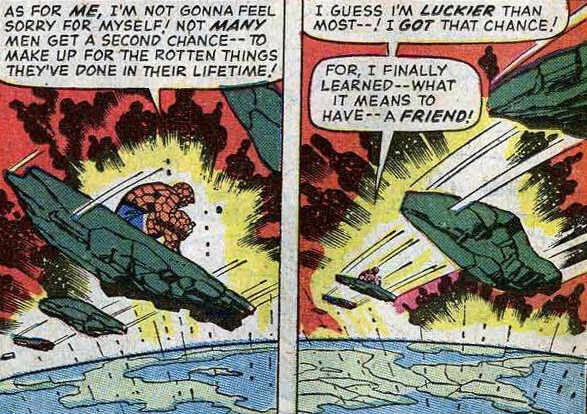 In terms of the FF, then their paths would cross in the mini-series Fantastic Four Fireworks (1999). The issue isn't a particular high point, with Johnny and Wyatt spending most of their time verbalising what's in front of them, but it's a real curiosity piece in that the main plot lasts for less than half the issue. In so doing, it acts a testament to how defined the characters have become that pages can be given over to them just conversing or playing sports together, without it feeling like padding. The vibrancy of the characters shines through, even though the year is, curiously, a very reactive one, with the FF not directly involved in many of the plot resolutions. (And, in Johnny's case, often not involved at all, appearing for just over a single page in #56). Johnny's frequent absences from the team (due to college/moping after Crystal) see the first instances of one of the group not appearing on the covers... #51 and #56 feature the FF sans Johnny, while #55 sees Ben by himself, facing off against the Silver Surfer. Such a feat wouldn't be achieved again until 1967, when #62 saw Reed the only member of the group to make the front cover. (For trivia's sake, then the Torch had to wait until #99 to get a solo cover, and the first cover not to feature ANY of the group was #72, which showcased the Watcher and the Silver Surfer. Poor old Sue had to wait until 1978 and Issue #195 before being deemed worthy of selling an issue on her own merits, and even then, as the FF were undergoing solo stories, it couldn't have worked any other way). #55 and #56 are fun but somewhat shallow "battle" issues, with Ben battling the Silver Surfer for no real reason, and then the thinly-motivated Klaw attacking them in their building. Although Klaw is a fine if somewhat underutilised villain, it perhaps says much that his appearance in the following year's Hanna Barbera cartoon series was in a half-length episode, his plot easily told in ten minutes flat. Talking of cartoons, Marvel's first cartoon production - The Marvel Super Heroes - aired in 1966 and is being watched on TV by Ben in #57. In terms of pure trivia, then religion gets a look in, with Reed at one stage talking about "Satan", and, more significantly, the first reference to Ben's religion. Told by Sue that he's been "obdurate", we get a jokey reference that his religion has nothing to do with it, 36 years before the major revelation of his real religion. Although the main characters don't get many major developments, Ben does insist on himself being "blue eyed" on a number of occasions (despite printers sometimes giving him brown eyes in earlier years) and the Black Panther states that he regards Reed as the most "dangerous" of the four, despite the powers of the others increasing. This said, Ben gets another foe who is able to physically overpower him in the shape of the Silver Surfer, so his status in Marvel's strong man pecking order takes a further knock. In the final issue of the year, the Silver Surfer claims to have been studying Earth for "many long months" after his arrival there, making the timespan between issues #51 and #57 seemingly longer than usual, particularly as Wyatt also tells Johnny that he's spent "weeks" training Lockjaw, just one issue after he got the idea of doing so. Plus, look out for the debut of the "Kirby Krackle"... an artistic effect whereby energy is made up of black circles. Finally, the issues of the year strike a macabre note with the inclusion of the "He's Looking for People Who Like to Draw" ads. Featuring regularly in the title since the very first issue, they depicted the art correspondence school of Albert Dorne, which was formed in 1948. Dorne sadly died in December 1965, and the ads were taken over with an illustration of one of Dorne's key members, Norman Rockwell. Rockwell's first appearance was in Issue #52... meaning that Issue #51 hit the stands with the image of a then-deceased man advertising his drawing school.